Losing a job naturally, takes a significant toll on you. It not only disturbs you mentally but also shows its effect on your health. Nonetheless, it is a part of life. Even though you cannot do anything or much to change decisions made by the company but you can make an effort to overcome your grief cycle and trauma. This can only be done once you have accepted the situation you are in. 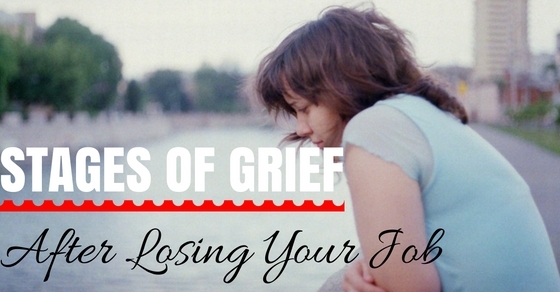 And this article will help you relate to and come to terms with the different stages of grief after losing a job. One does not lose a job suddenly. Things like this happen over time. And most often the employees know the reason. It may rise from poor performance by the employee or problems that cannot be overlooked. However, you are well aware that the brunt is coming your way when things go out of hand. Having said that, knowing what is coming does not keep you calm. It is natural to be anxious and to hope that they would let you off the hook one last time. But every so often employees are called to be sacked and the anxiety building up inside the person takes a massive toll on mental and physical health. This also marks the beginning of many illnesses that makes it harder to face life as it comes. The hardest moment to pull through is when your employers break the news to you. It is sad but sometimes it has to be done. They would expect you not to take it on a personal level but that cannot be helped either. You will feel as if someone has moved the floor from under your feet. And the worst feeling is that you do not have the power to bring things back to normal. You will be at a loss for words and nothing you say is going to make any changes. This moment right after they tell you that you are no longer employed is the time you get a bolt from the blue. However, it is not as if you were completely clueless about why you were called. The moment of shock is inevitable and the strongest of minds have lost to it only to have their faith restored as time passed. It is nothing out of the ordinary to feel clueless when you lose a job. It is not something you can prepare for. And finding a new job takes time and patience. However finding your own confidence before looking for a job is more challenging. Losing a job does to some degree leave your confidence broken. While it is not something that will have you for the rest of life, it takes time to go. And it is you who will have to make every effort to have faith in yourself. It is not always your fault that you get sacked. You can even go for career counselling sessions to find out what kind of work suits you best. You would be surprised to know that most employees are entrenched not because of performance issue but because they were never actually meant for the kind of work they did. You may suddenly start feeling that life does not hold meaning for you anymore. The thoughts get so out of hand at times that you often feel like ending your life. But you must know that this is nothing but stupidity. Losing a job does not mean that there is nothing else for you to do. It is a signal that there are other things to do that are more suitable for you. And on the bright side if your job meant the world to you then that means things can only get better from that moment on. And remember that taking your own life is not the solution. Maybe killing yourself will end your suffering here on earth but it will make it difficult to live for people close to you. You will always be able to think of someone to blame at times like this. But do not get such negativity get the best of you. People do a lot of things in anger they later regret. You are already at down low and you do not want things to get messier by any means. And pinning you’re the reason of your problems on others is not going to help you in any way either. But the challenge is to keep your head calm and think things through before making a mistake in rage. Understand that there is nothing you can do that will turn back time and stop whatever happened from happening. You will want to be isolated from your family. That is normal because you would not immediately want your folks to know that you are out of work. Moreover you may think that it is shameful to lose your job. But it is nothing that you have to be shy of from sharing with your family. These are the people you know will be there for you at the end of the day no matter what. More so, this is your family, not neighbours or distant relatives that they would make room for gossip. Everything may start to seem vain to you. You will most probably take up a cynical view of life after losing your job. But there is nothing more pathetic than giving up hope. Hope is what literally gives us the strength to move forward across every challenge life throws at us. And losing a job is nothing but a test to see if you can get back up on your feet as many times as life knocks you down. It is undeniably hard but you will still have to find a way to hold up in the face of bad times because nothing lasts forever. You tend to lose your better judgment when you are amidst a turmoil like losing your job. It is better to discuss with your parents or wife about every important decision you are willing to make at this point in your career. You are most likely to have thought it half way through and you would be lucky to be set straight by your near and dear ones. Do not ignore your children either. Sometimes they are the solution to problems you thought was otherwise killing you inside. You may even talk to your kids if you feel that it is going to make things easier for you. Do not make your family members the victims of your anger and disappointment. They have done nothing to deserve such treatment nor do you have any right to make them feel bad about life just because you cannot cope with your situation. Do not be selfish. Try to keep others happy even if you are fighting hard to keep your head above water. True happiness is when you make others happy. And if you think having others share the misery of life with you is a good idea then think again as you might be doing more damage than good for yourself. Depression stage is the most challenging thing that you will have to fight off. Depression is the root cause of all other problems that might follow. Try to keep all kinds of negative thoughts and imagination at bay. Do not give into decisions that will worsen the situation not just for you but for everybody who are living with you. There are different ways and AHS’s (Alternative Health Solutions) you can use like anti-depressant pills. But the best option is to go to a counsellor. That is most probably the only answer to depression without side-effects. The after-effects of depression may have life altering influence on you. If you do not find a proper way of fighting depression you will find yourself getting lost. This is a crisis that if goes beyond a certain marks stays and haunts you forever. The best possible manner to deal with depression is to not depend on any kind of medicine as it has been seen to go horribly wrong for some patients. The later effects may come in any form and ways be it physical or mental it will not be good for you. Try fighting depression off as early as possible. The one thing that you need to keep in mind is that you could not have been asked to leave the job if you did not have one in the first place. So if you had a job that means you earned your place in the company before. It is common feeling for those who have lost their jobs. But before you convince yourself to accept that you are one. You have better look back on all the times you made your company proud. They accepted you in the first place which means they saw in you what they expected to see to take you in. More importantly it is rare that a company expels just one employee at a time. Most of the time is due to entrenchments that a big number of employees are gotten rid of. So do not even for a second think that you are all alone in this ordeal. And more often, companies give their employees jobs at other companies if possible. It is not uncommon to feel that you are not fit to be running the race of life anymore once you lose a job. But you have to understand that life is all about losing and gaining. Nothing stays constant, nothing will ever be as it is now. Things change and you have to accept it. Maybe for some reason your employers thought that they would be better off without you but that does not concern you anymore once they let you go. Your primary concern should be how to make your life worthwhile without wasting a second on people who do not value your efforts. In times such as this you lose the ability to think straight. You are not able to think as efficiently as you did before you lost your job. One cannot but admit that losing something as important as one’s job is not an easy thing to accept. But it is very common and these days so many private companies have sprung up that the competition has become tougher than it ever was. So any lack of effort may result in immediate sacking. So if that is the case then walk the extra mile and work harder than ever to win an even better position at a company that appreciates having you. Once you start feeling cut-off from the society you will turn to medicinal help to relieve your suffering. This is how the tale of drug abuse begins. Once you have been prescribed medicine for your depression you get the habit of taking it every single day. So eventually it becomes impossible for you to get rid of the habit. Not only will you succumb to its effects with each passing day but also lose all hopes of regaining your confidence. By the time you start seeing things as they are it would be too late for you to turn round. So by all means say no to drugs and remember that you are too strong to waste life away like that. You may undergo all or some of the above given descriptions of problems and different stages of grief you feel on losing your job. But keep in mind that nothing is unbeatable and the given brief solutions to each problem will help you to make the decisions for yourself. Only remember to never give up on hope or second chance.